Have you ever experienced cute and terrifying nightmares of a fantasy rabbit? "Dream Master is a fun little tower defense game"
"it clearly has a unique, consistent creative vision behind it"
Enjoy this new and original game of a well known genre, with a storyline and a great sense of humor! Go through the nightmares and defend your sanity by withstanding nightmare monsters with the help and comments of the Green Guru. Follow the storyline by reading hand drawn comics before each level. Build towers and use skills to stop hungry monsters from eating your brain and consciousness! Enjoy cool and funny sounds and chill-out background music! Become the terror of your Nightmares and the Master of your Dreams! • Campaign with dramatic but funny storyline, that can happen to every fantasy rabbit. • Cute but hungry and terrifying nightmare monsters with their own individuality each and some with totally unexpected skills! Beware! • Skill's to use wisely! • In-game nightmare diary with pictures, description and sounds for each nightmare monster! • Briefings and cool storyline comics before levels! • Many unique and funny sounds for each monster and in-game actions. • Chill-out background music that will enrich game atmosphere! • Dynamically appearing background monsters on game maps - nightmares are taking over! • 2 difficulty levels - "normal" for pleasure playing and "hard" for real tactical challenge! • Funny and valuable in-game comments from the Green Guru and nightmare monsters themselves. 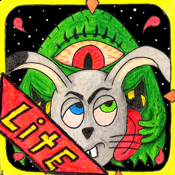 This is a lite version - only 2 levels are available.